Our email signature management solutions for Office 365 (CodeTwo Email Signatures for Office 365) and on-premises Exchange Server (CodeTwo Exchange Rules Family) can add one-click email surveys to your correspondence. This feature can help you measure your customer satisfaction in a highly effective way. Knowing how satisfied your customers are is very important. If your customers are not satisfied with the services you offer – you need to rethink and redesign your customer relation strategy. If their satisfaction is high, you need to ensure it remains that way. Opinions customers send on their own via email or post on social media are valuable, but, if you look at the big picture, rather rare in comparison with the number of all customers you serve. That is why we decided to provide you with an easy and effective way to check how your customers rate their experience. Instead of using long CSAT surveys which annoy most customers at first glance, you can use one-click surveys. One-click surveys offer customers a pleasurable way to share their thoughts without losing their time. 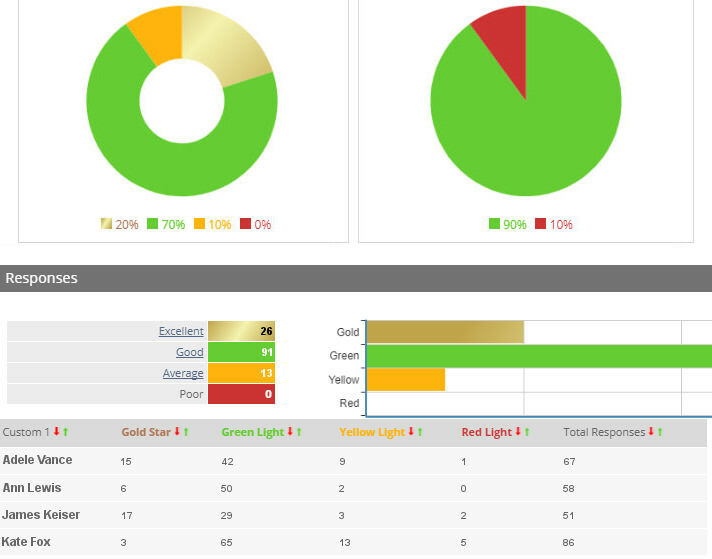 This way, more people will express their opinions, and you will be able to monitor your team’s performance in real-time. The great thing about one-click surveys in email signatures added by our software is that they are fully automatic, like any other signature element. You can use a single rule to add one-click surveys for all users. Signatures will remain unified across your organization, while buttons will rate each employee individually. What is more, you can freely modify those surveys to fit your email signature design. This way, you get an important feature without compromising your visual identity. With one-click surveys, customers can share their opinion with a single click, which does not take more than 5 seconds. This encourages people to rate their experience. Each click opens a new landing page in which you thank for the response. But that is not all – the landing page includes a simple comment box. Users can but do not have to add a few words in here. Because people are encouraged by the simplicity of the one-click survey, and adding a further comment is nearly as quick and easy, you can be sure that more people will share their thoughts. This way, you can get ideas on how to improve your customers’ satisfaction, gather feature requests and even find out who might be willing to give you a valuable testimonial. One-click surveys offer a very high response rate. And the more people respond, the more accurate results you get. The data you get makes your team performance measurable. Detailed reports will indicate who is progressing in this area, and what might be the reason for a sudden increase or decrease in customer satisfaction. If you additionally reward the best performers for reaching a certain goal, you are sure to receive a substantial morale boost.